We compare the Wii U's opening months to the 3DS, Wii, GameCube, Nintendo 64, and DS. The latest financial report from Nintendo regarding the Wii U isn't too uplifting. From the system's launch in late November 2012 to the end of September 2013, the Wii U moved 3.91 million consoles. In the past six months, only 460,000 consoles have sold. 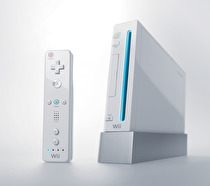 Even the Wii sold more over the past six months. Time to catch up with the blue blur. Recently I have been playing through the latest Sonic game, Sonic Lost World for the Wii U. Leading up to the release one of my concerns was, how well would Sonic control this time around? Thankfully, the answer is, quite well. Why is the Darumeshi Sports Shop owner an Osaka-dialect-speaking Dalmatian? For the second year in a row, Nintendo kills it at New York Comic Con. Nintendo once again put together a pleasant showing to New York Comic Con, which was made even stronger by the fact that Microsoft and Sony with their fancy new consoles were nowhere to be seen. A month away from the next generation, the Xbox One and PlayStation 4 were absent from the New York Comic Con show floor. Mario, Zelda, Wii U, and 3DS, though, were all over the place.